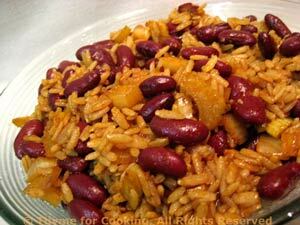 Brown Rice and Red Beans, Oriental style, simple, healthy gourmet side dish. Sauté onions and celery, add red kidney beans (or any color/type of bean) and cooked, brown rice for a nutritious side dish, full of vitamins and fiber. Use quick-cooking brown rice to save time. Flavored with soy sauce, sherry and Balsamic vinegar, this gives 'Beans and Rice' a whole new meaning! Cook rice in chicken stock, 15 minutes, or until done (check package directions). Thinly slice onion and celery. Open, drain and rinse beans. Heat oil in medium nonstick skillet over medium heat. Add paprika, onions and celery and sauté until tender, 6 - 8 minutes. Add beans, vinegar, sherry and soy sauce. Heat through. Cover and reduce heat to keep warm. When rice is done, stir into beans and serve.